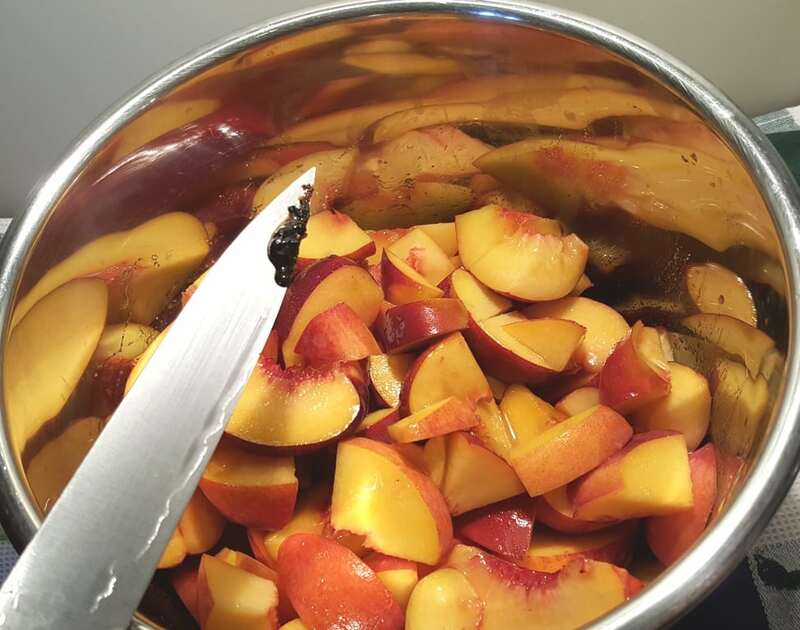 Pressure Cooker Fresh Peach Crisp Compote is a delicious and sweet topping for desserts, ice cream, yogurt, toast and more. There are so many wonderful recipes to make with Summer fruit. I like to take advantage of the season and make as many fruity recipes as possible. 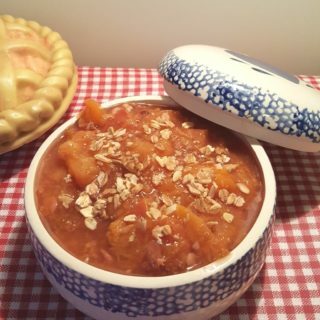 I actually made a double batch of this Pressure Cooker Fresh Peach Crisp Compote, since I love it so much. 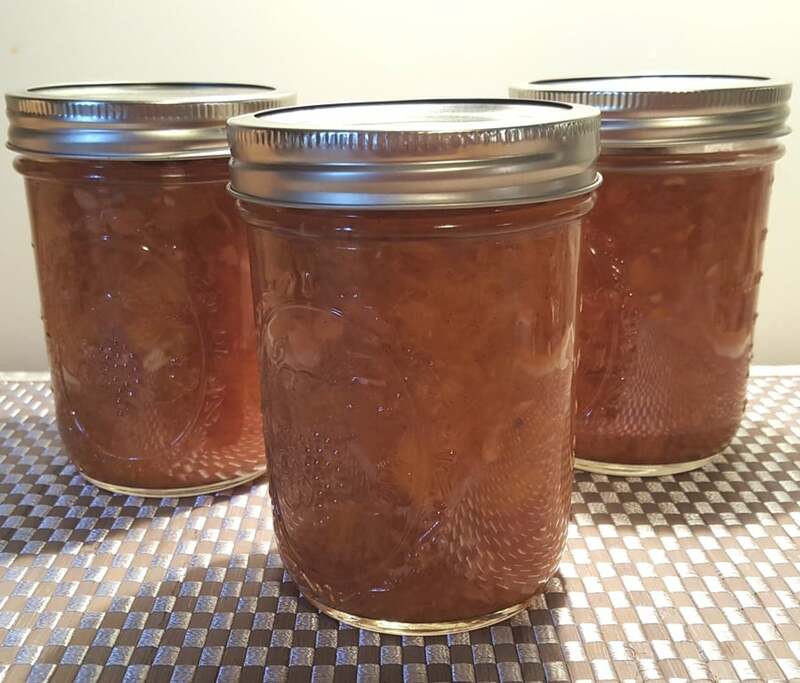 I use canning jars and my Foodsaver, so that I can have Peach Crisp Compote, all year round. 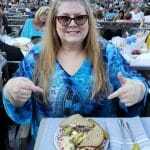 For more Compote flavors, check out my Pressure Cooker Fresh Berry Compote, Fresh Strawberry Compote, and my Dannon Dutch Apple Yogurt Compote. 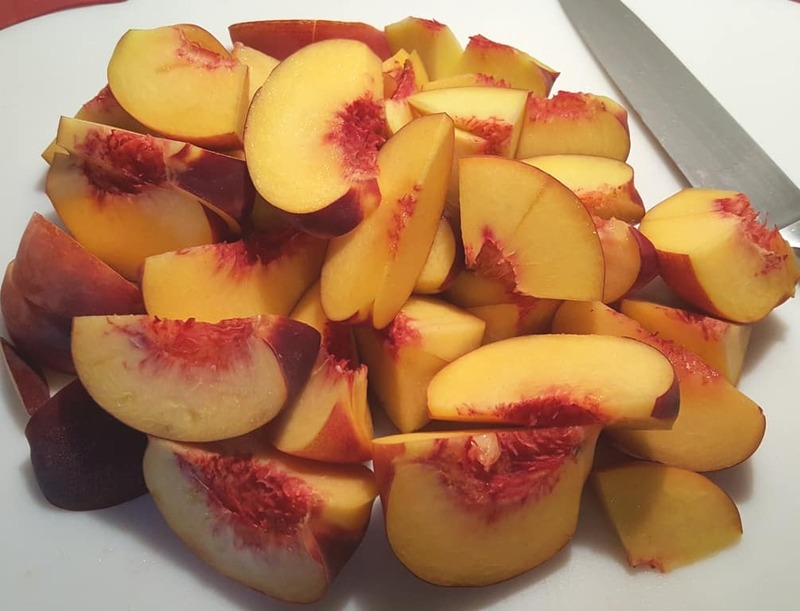 Oh my gosh, I just want to take a bite out of these peaches. They look so yummy. I leave the skin on, but if it bothers you, just remove the skin. 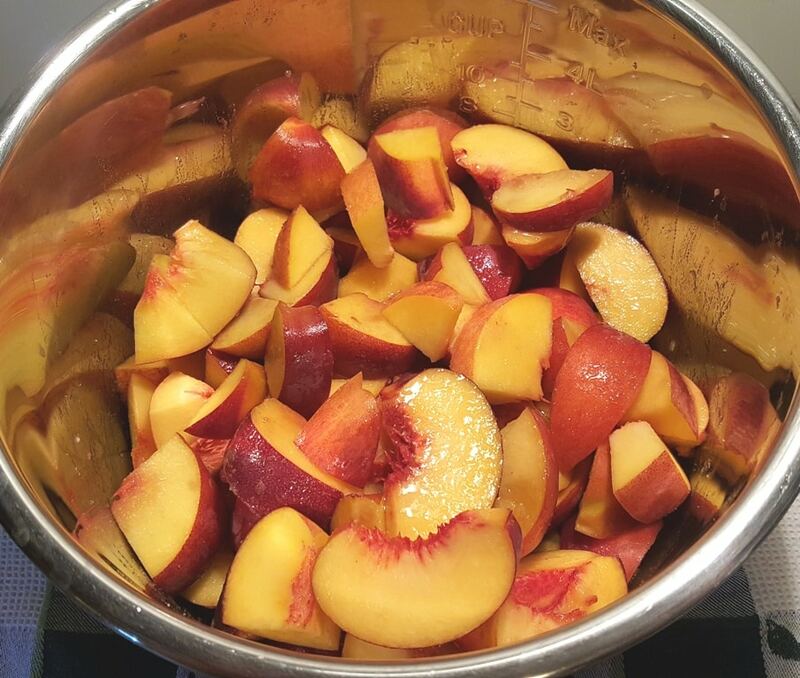 Into the Instant Pot or Pressure Cooker cooking pot, go the peaches, sugar, vanilla and cinnamon. If you like nutmeg or ginger, think about adding a tiny amount. 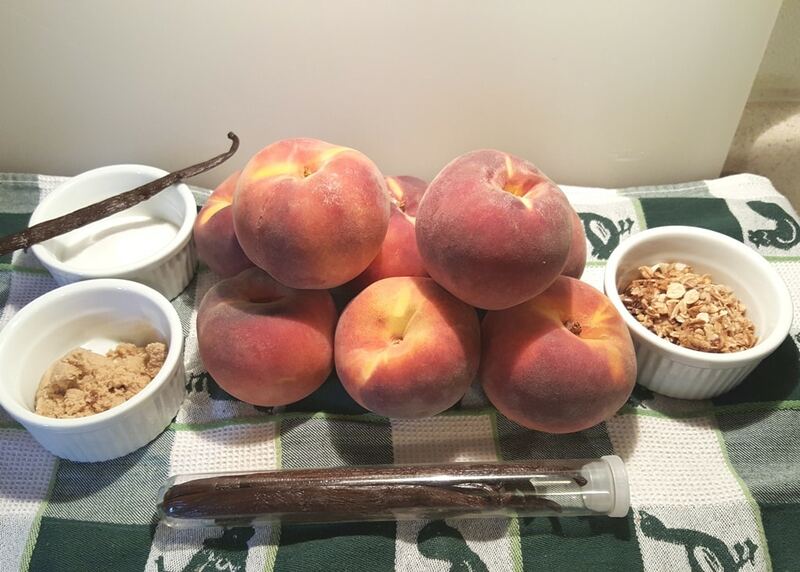 Sometimes, I add a handful of Bob’s Red Mill 5 Grain Hot Cereal to the Peaches before Pressure Cooking for more texture, if I am planning to use the compote with Homemade Greek Yogurt. If you want a stronger, Crisp/Cobbler taste, add in a Tablespoon of butter. If I am using this Pressure Cooker Fresh Peach Crisp Compote over a New York Cheesecake, Cake or Ice Cream, I do like the added butter flavor. 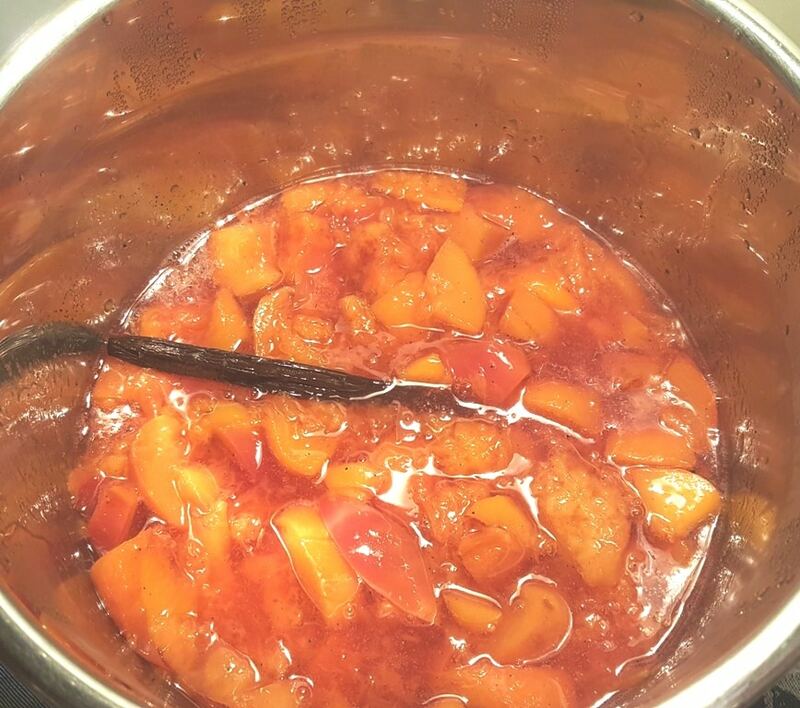 I will also cook down the Fresh Peach Crisp Compote to remove some of the liquid and make a more syrupy consistency. Scrape the caviar out of the Vanilla Bean and place it in the Instant Pot or Pressure Cooker cooking pot. I like to drop in the whole Vanilla Bean after scraping out the caviar. It adds more vanilla goodness. 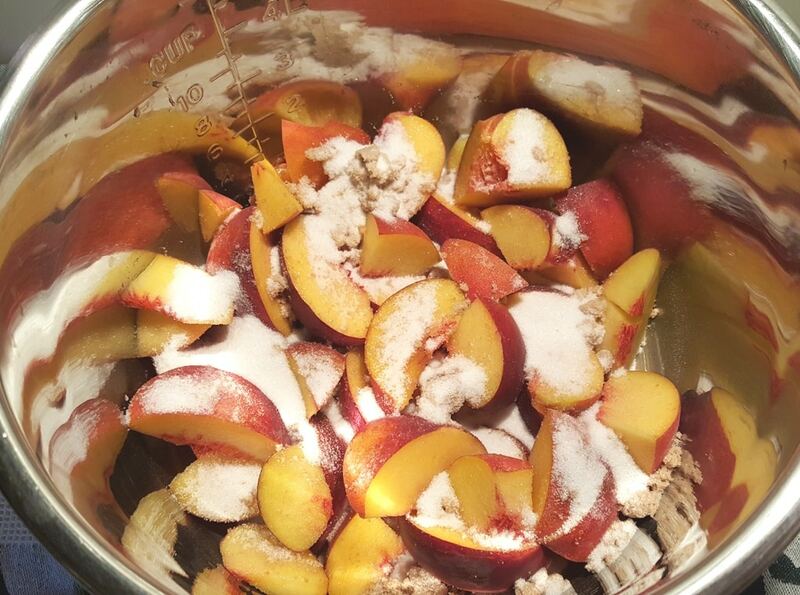 After the pressure has been released, mix the peaches around to finish breaking up any chunks. 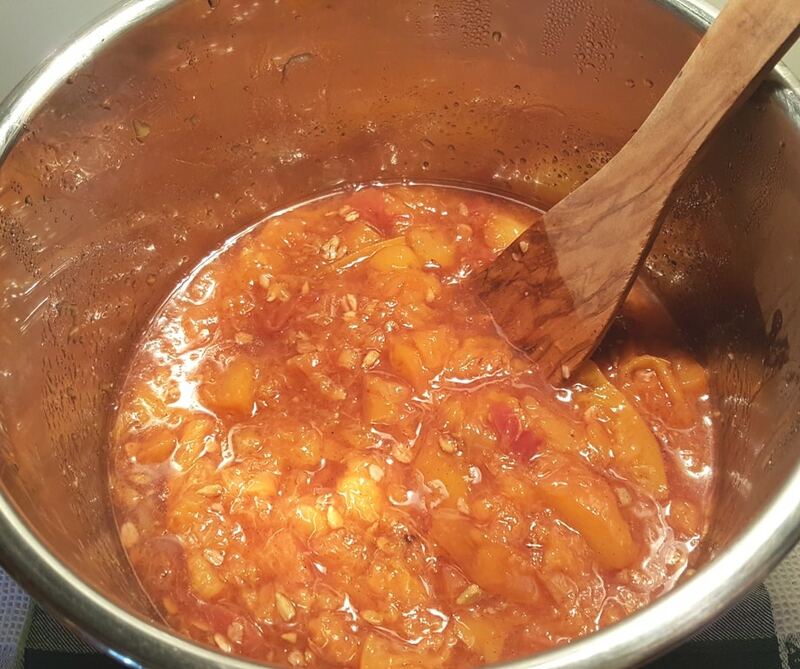 If you want a thicker, more syrupy compote, use the Sauté or Browning feature, to evaporate some of the liquid. 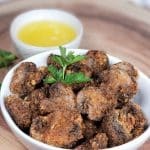 Mix in the Grapenuts Nuggets Cereal. 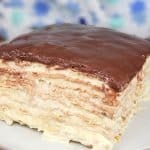 The heat will soften them to the perfect texture. Taste and adjust to your desire. Some people prefer a sweeter taste or a stronger cinnamon taste. This makes quite a bit and I like to store my Pressure Cooker Fresh Peach Crisp Compote in Ball 16 oz Wide Mouth Mason Jars or use my Foodsaver and freeze them for later in the year. This is delicious over my Pressure Cooker New York Cheesecake, over ice cream. It is especially yummy on Homemade Thick Greek Yogurt. 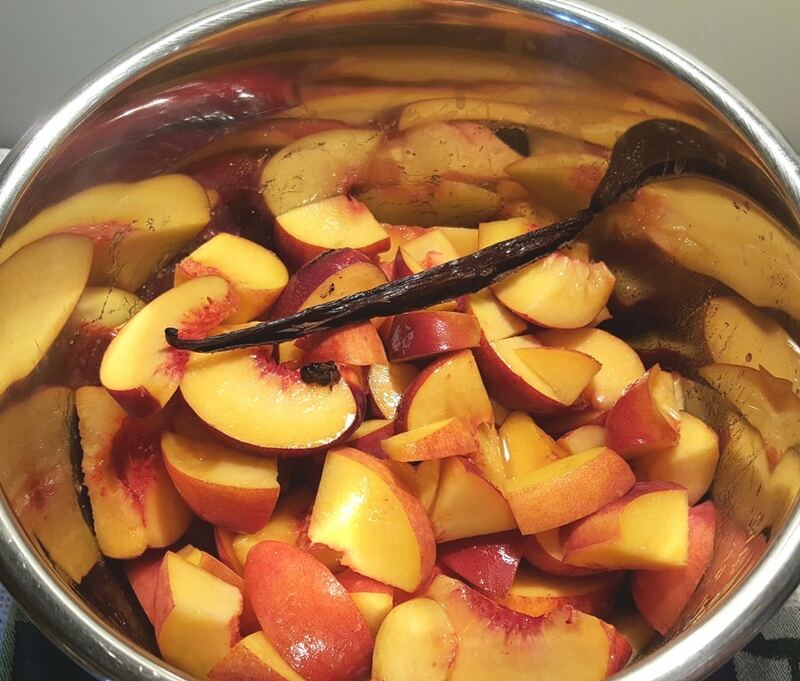 Add peaches, sugar, cinnamon, vanilla bean caviar, vanilla bean and vanilla to Pressure Cooker cooking pot. 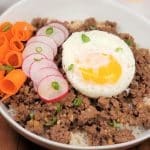 If desired, add oats. 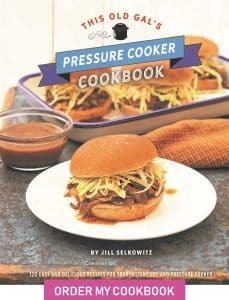 Cook at High Pressure for 1 minute. When Beep sounds, wait 10 minutes and then release the rest of the pressure. For a more syrupy Compote, simmer, until desired consistency. Add Grapenuts and mix through. 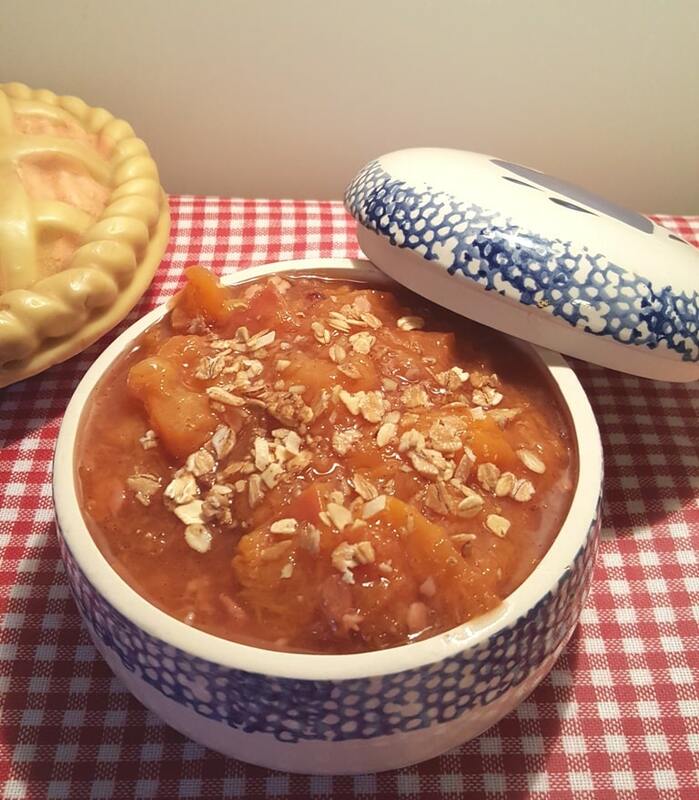 PIN this Pressure Cooker Fresh Peach Crisp Compote! What kind of vessels do you use in the cooker? 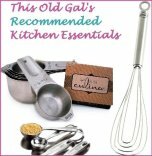 Can you use Ancher Hockey, Corney ware glass pie dish can you use the reg cake pan.I’m afraid to try any of these things for fear of breakage.I love your recipes and wand to try them but I don’t know what to use. What is the purpose of the Grape Nuts cereal and how much do you add? I’m wanting to use the compote for my greek yogurt. I understand adding in the 5 grain cereal as a thickner but unsure if the Grape Nuts are used as a further thickner or just to make a peachy Grape Nuts cereal. 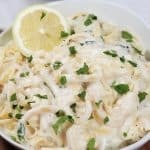 Can I make this with frozen peaches? Would I have to make any adjustments? Did you process the jars in a hot water canner? This old gal never answered the question. In my opinion, BWB canning is needed if you want to store on the shelf. A 10 minute bath would be acceptable.